Description: This book examines important social movements in Hong Kong from the perspectives of historical and cultural studies. Conventionally regarded as one of the most politically stable cities in Asia, Hong Kong has yet witnessed many demonstrations and struggles against the colonial and post-colonial governments during the past one hundred years. Many of these movements were brought about in the name of justice and unfolded against the context of global unrest. Focusing on the local developments yet mindful of the international backdrop, this volume explores the imaginaries of law and order that these movements engendered, revealing a complex interplay among evolving notions of justice, governance, law and order and cultural creations throughout the under-explored history of instability in Hong Kong. 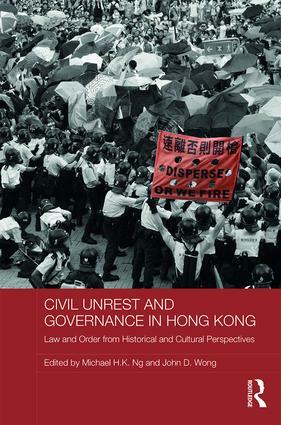 Underscoring the apparently contrasting discourses on the relationship among the rule of law, law and order and social movements in Hong Kong, the contributors emphasise the need to re-examine the conventional juxtaposition of the law and civil unrest. Readers who have an interest in Asian studies, socio-political studies, legal studies, cultural studies and history would welcome this volume of unique interdisciplinarity. Faculty chapter contributions by Michael Ng, Albert Chen, Benny Tai and Marco Wan.